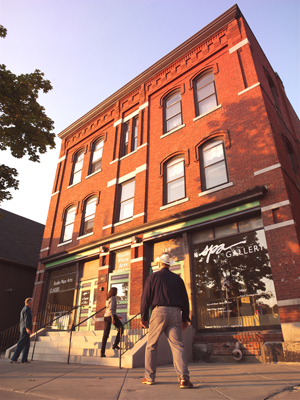 Back in 1998, a group of artists seeking a site for a community arts space were approached by the Barre Historical Society to rescue one of the oldest buildings on Main Street in Barre City, the Nichols Block, from demolition. Fire and other neglect had harmed the Nichols Block and the costs to renovate the building appeared to be prohibitive. A financial package was successfully assembled, a certified historic renovation plan was developed, renovations were completed, and SPA was born. Naturally, a major expense at SPA relates to the debt incurred with the renovations. We urge you to help us in working towards retiring the debt; please Join Us and support our “Retire the Mortgage Fund,” and you’ll strengthen every aspect of our work. SPA proudly opened its doors in November, 2000. From its early days, SPA was viewed as providing a threefold benefit to the region: Economic development, cultural enrichment, and community service. Barre City is an ideal location for SPA because it is a city that has a lively cultural history due to the many artisans who relocated to the community from Europe to carve a locally available stone, the high-quality Barre gray granite. Historically nearly all of the resource extraction, manufacturing jobs, and creative, skilled work in Barre were connected to the local stone carving tradition. SPA has become an important regional resource for art making, learning and exhibition, and is committed to providing dynamic programs for people around central and northern Vermont. We look forward to continuing to develop our creative institution.